I really haven’t done much knitting worth showing in the last couple of days other than Matt’s blanket but I had to share this from Chicks with Sticks last night. I knit with a man named Matthew who can knit anything. I mentioned to him that all I needed for the next store window was a turkey & he shows up with this! 13 years ago by Kat in Holiday , Knitting , Needlecraft | You can follow any responses to this entry through the RSS feed. You can leave a response, or trackback from your own site. I love it! He is very talented! Too cute! That is too funny (and cute)!! Holly CRAP~ Matthew is a nut! What a great job. I love it. Gobble gobble! Cudos to the creator! Yes, he brought The Knitting Turkey to the Tuesday night group, too. Funny, I *ALMOST* brought my camera last night, but didn’t. Conversation got pretty crazy, and it was decided that he needs to make another one out of Touch Me (the “Touch Me Turkey”) with a zippered c-section scar and removable uterus. He was working on the knitted dachshund. That is wonderful~~my kind of turkey!!! You must tell him how much we enjoyed seeing it~~thanks for sharing!! ROFL!! That is awesome! That man has talent for sure! I hope that you had a wonderful day today!!! I hope that everything went beautifuly!!! I can’t wait to hear all about it!! ohmygosh! 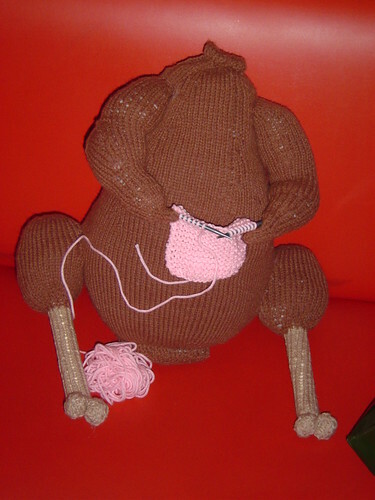 a headless knitting knitted turkey…hee hee ha ha! That’s just hilarious. I think it will be fantastic in a shop window – make people stop and look, you know. I showed it to my (non-knitting) husband and he thought it’s funny too!